We’ve talked recently about how to publish your Twitter updates to Facebook Page or personal Profile page. 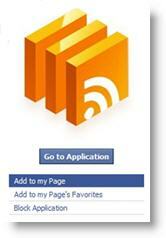 Now here’s a new Facebook application that can take your RSS-to-Facebook to a whole new level. Do you want to post the content from several different blogs and social networks to your organization's Facebook Page, and add a news alert feed for your cause's keywords, too? And let's say you want to “mix and match” — to post RSS feeds ‘A’, B’, and ‘C’ to your personal Profile; and post feeds ‘C’, ‘D’, and ‘E’ to the Facebook Page for your national organization; and also post feeds ‘A’ and ‘E’ to to the Page for your local chapter? RSS Graffiti periodically checks the RSS/Atom feeds that you specify and posts any new entries it finds to the Facebook Walls that you specify. You can get any feed written on any wall. In fact, multiple feeds to multiple walls. You choose the combination. RSS Graffiti is a very new Facebook app — in fact, it’s still in beta, so be aware you may run into a glitch or two — but they seem to be all over the customer service at GetSatisfaction and also responsive on Twitter. At the moment, maybe because of some issues going on at Facebook itself, you may find that you've got to do a double opt-in to allow the application to access the information it needs to operate, so don't be surprised by the number of steps to go through. I've been playing with this on my Facebook test pages, the last couple days, and it seems pretty solid so far. If you’d like to try out this application, you’ll find RSS Graffiti on Facebook at http://www.facebook.com/RSSGraffiti. Add it to your Page (there's a link in the sidebar), then Edit Page to find it listed under Applications, and click the pencil icon on the right to set up your feeds and tell RSS Graffiti where you'd like to post each one. Hi Rebecca, just wondering how you rate RSS Graffiti after a couple of months of your posting. I had a 21 day trial with Social RSS, which seemed to go quite well, but as opted out of paying $24 a month, meant that the feeds would't be updated regularly. In fact, they don't appear to be updating at all now! Have now deleted the application and looking for something else. As a charity (The Donkey Sanctuary) we are looking for something that will work on both the non-profit page as well as group pages. Ideally, want to include various feeds from both our sanctuaries in the UK and Ireland as well as our subsidiaries in Europe. RSS Graffiti looks the way to go.